The summer issue of Nutrition Frontiers showcases vitamin D-related genetic variation and cancer risk, the therapeutic potential of zerumbone, a ginger extract, against hepatocellular cancer, and the temporal efficacy of sulforaphane-based broccoli sprouts. Meet our spotlight investigator, Dr. JoAnn Manson, and her research on nutrition and lifestyle factors related to cancer and cardiovascular disease. Learn about passion fruit, the dimpled fruit that packs in the punch, upcoming announcements and more. 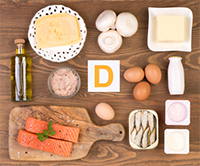 Several observational studies indicate an inverse association between circulating 25-hydroxyvitamin D (25OHD) and cancer incidence and a person’s genetic background may contribute to this association. Mendelian randomization studies of single nucleotide polymorphisms (SNPs) influencing plasma levels of 25OHD can be used to investigate the effect of lifelong differences in 25OHD and risk of cancer. In a cohort of 1782 women from the Women’s Genome Health Study who had previously available 25OHD measurements and genotype data, Chandler and colleagues derived a genetic risk score (GRS) based on five SNPs known to influence plasma levels of 25OHD in the DHCR7, CYP2R1, and GC genes. Although the GRS was associated with circulating 25OHD in the lowest versus the highest quintile of the GRS, none of the SNPs were associated with incident total, breast, colorectal or lung cancers or total mortality. Future research is needed to investigate the efficacy of vitamin D supplementation in reducing cancer risk and the role of vitamin D-related genetic variation in the setting of vitamin D supplementation. Applications are now open for NCI’s Cancer Prevention Fellowship Program! Application period May 1-August 25. 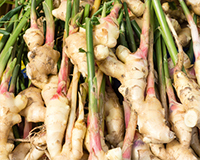 Zerumbone, a dietary compound derived from the ginger plant, exhibits anticancer activities in serval tumor models. Zerumbone’s antiproliferative and anti-inflammatory activities act through the modulation of NFκB activity. Here, Wani and colleagues investigate the therapeutic potential of zerumbone against hepatocellular carcinoma (HCC). Although control cells were minimally affected, Zerumbone inhibited proliferation and clonogenic survival of HCC cells in a dose-dependent manner by arresting cells at the G2-M phase and inducing apoptosis. Gene expression profiling revealed that zerumbone treatment resulted in significant deregulation of genes regulating apoptosis, cell cycle, and metabolism. Further, there was significant suppression of glucose consumption and reduction of lactate production, suggesting glycolytic inhibition. In immunocompromised mice, zerumbone treatment suppressed subcutaneous and orthotopic growth and lung metastasis of HCC xenografts. Zerumbone’s impact on cell cycle, apoptosis, and metabolic processes suggests further investigation into zerumbone as a strategy for preventing or treating HCC may be warranted. Sulforaphane (SFN), an isothicyanate found in cruciferous vegetables including broccoli sprouts (BSp), has been shown to modulate epigenetic pathways in vitro and in vivo and reduce the risk of breast cancer. Li and colleagues investigated temporal transplacental effects of a customized enriched 26% BSp diet (4 cups/day of BSp) and a TestDiet (all dietary ingredients except BSp) in SV40 and Her2/neu transgenic mouse models prenatally, postnatal early-life (before puberty) and in adults. Tumor latencies were significantly lengthened in SV40 (10.34%) and Her2/neu mice (30.83%) administered a prenatal/materal BSp diet compared to 4.9% and 18.8%, respectively, when given at the beginning of postnatal early-life stage. The prenatal/maternal BSp treatment resulted in maximal inhibition of breast cancer incidence in the offspring of transgenic mice compared to postnatal early-life exposure, which was more effective than adult exposure. Further studies are warranted to evaluate an efficient lifespan temporal pattern for epigenetic-modifying dietary compounds and natural bioactive diets in breast cancer prevention. 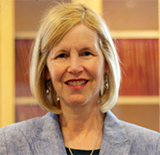 JoAnn E. Manson, MD, DrPH is Chief of the Division of Preventive Medicine at Brigham and Women's Hospital (BWH), Professor of Medicine and the Michael and Lee Bell Professor of Women’s Health at Harvard Medical School, and Professor in the Department of Epidemiology, Harvard T.H. Chan School of Public Health. Dr. Manson is an endocrinologist and physician epidemiologist and is an elected member of the National Academy of Medicine and the Association of American Physicians. Her primary research interests include randomized clinical prevention trials of nutritional and lifestyle factors related to cancer and cardiovascular disease and the role of endogenous and exogenous estrogens as determinants of chronic disease outcomes. Dr. Manson is the Principal Investigator of several research studies, including the VITamin D and OmegA-3 TriaL (VITAL); the Women’s Health Initiative Clinical Center In Boston; the COcoa Supplement and Multivitamin Outcomes Study (COSMOS), and the cardiovascular component of the Nurses’ Health Study. The flavorful tropical passion fruit, Passiflora edulis, also known as granadilla, is a native of Southern America. It is one of the original fruits in Hawaiian Punch and has long been appreciated globally in New Zealand and Australian jams and jellies, Venezuelan ice cream and Vietnamese smoothies. Passion fruit’s thick skin makes up 50% of the fruit and houses carotenes in the yellow variety and mainly glucosides and flavonoids in the purple variety. The edible seeds are packed with fiber and niacin and the fleshy pulp offers an aromatic flavor and a heathy punch of vitamins A and C, potassium, iron and the flavonoids β-carotene and β-cryptoxanthin. This summer try a ripe dimpled passion fruit in a variety of ways - simply cut in half and scoop the sweet and tart seedy pulp to eat fresh, add to smoothies or even mix into a green or fruit salad. Consider spooning on ice cream or over cheesecake to add a little crunch. For a cool refreshing drink concoct your own Hawaiian punch simply by diluting the pulp with water, orange or pineapple juice, ice and sweeten to taste!